What Does Success in Learning Look Like to You? I’ve been taking online and in-person workshops for several years now. I took a week-long in-person writing workshop last year and learned a ton. I missed that one technique because I had trouble writing the story. Why did I have trouble? I fell into the “Who am I to write this?” trap. I don’t often fall into that trap and it took me a while to write my way out of it. Yes, I decided to practice my writing to conquer my fear. I learned a lot from that workshop, and not just from the stories I wrote. I’ve been teaching online workshops for a couple of years and in-person workshops for the more than 20 years. In my in-person workshops, we more often work as teams (agile and management workshops lend themselves to team-based work). In my online workshops, participants work alone. We get together to debrief their work. I’m experimenting with a little bit of pair/team work. It’s more difficult online. People sign up because they need the training. They start off quite enthusiastic. They don’t always come to the workshop, even though they signed up. They all have good reasons for not doing the work. They got new work from a manager who “forgot” the person had signed up for the workshop. They day-to-day work overwhelmed them. Fear is a powerful tool. Fear can prevent us from learning, from experimenting, and from succeeding. In my online workshops, especially the writing workshops, I devote time the very first session to the topic of fear. In my experience, almost everyone is a reasonable writer. Sure, they might need some suggestions for making their writing clearer or less complex. I do that. And, I need to encourage people to see their fear so they can see it, and write their way through it. When I teach, I don’t expect that people will immediately understand what I teach, even with practice. 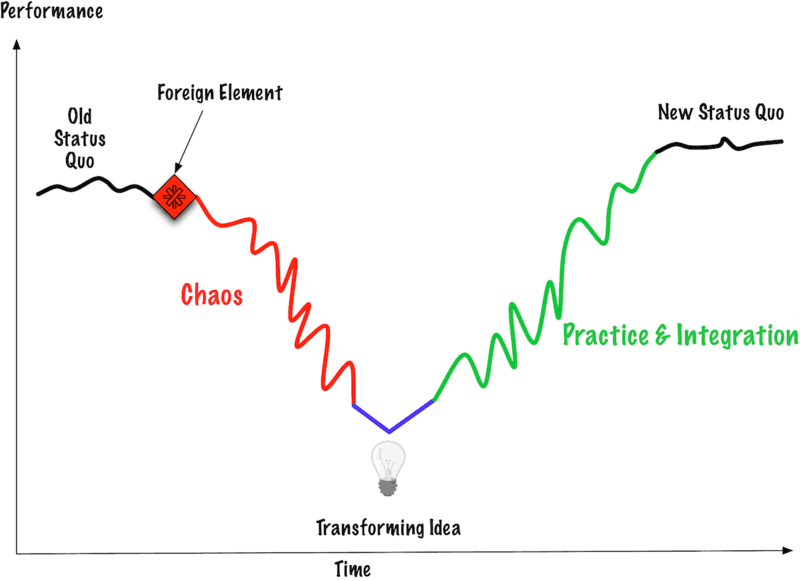 When we learn, we go through the Satir change model. Learning takes time. My job is to provide the tools to help them through the Chaos, where they might be uncertain. If I can provide enough options, they might see their way through to a Transforming Idea, and then Practice to achieve a New Status Quo. When I was in school, I often said I learned more from the final—or just after the final exam—than I did in the class. I suspect I am not the only one like that. 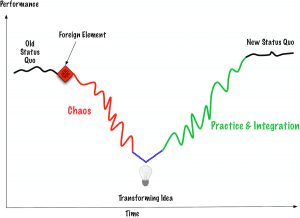 The finals often provided me the last bit of Practice and Integration to get to the New Status Quo. For me, success as a learner is to work through my fear and try whatever I’m learning, again and again. Dear adaptable problem solvers, that is the question this week: What does success in learning look like to you?